On July 31 at the outside stage in Pengzhou City, “Yotsudake” performed by Tamako Asato, Akiko Yamakawa, Keiko Taira, and Momoko Mizuno attracted an audience. The Okinawa Performing Arts Federation sent a delegation of Ryukyuan dancers to the 2016 Chengdu International Sister Cities Youth Music Festival, which was held from July 29 to August 2 at Chengdu City of Sichuan, China. 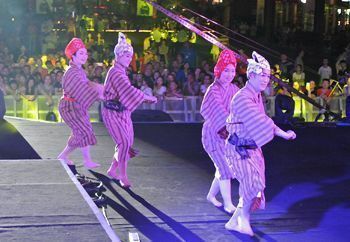 Okinawan traditional performing arts were developed during the Ryukyu Kingdom era to entertain guests from China. 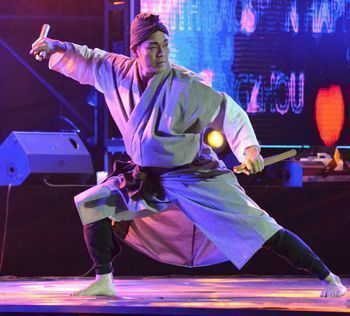 Once again, Okinawan performers have shared Okinawan culture with China. They also deepened ties with performers from other countries. Photographs show scenes from the Festival. 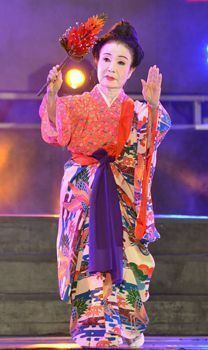 On July 31 at the outside stage in Pengzhou City, Setsuko Tamashiro performed “Digunu hana gukuru. 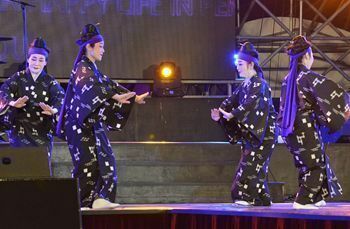 On July 30, at the Chengdu Eastern Memory in Pengzhou City, Akiko Yamakawa (left), Reiko Ota, Momoko Mizuno, and Shinji Uehara danced “Tanchame” in front of a large audience. On July 31 at the outside stage in Pengzhou City, dancers from Russia performed in an energetic way. 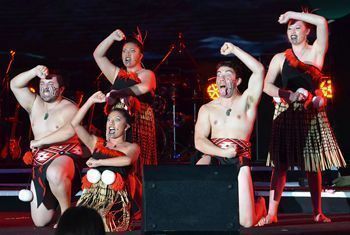 On July 30 at the Chengdu Eastern Memory in Pengzhou City, performers from New Zealand shared powerful songs and dances.